NEW YORK (November 4, 2015) — Iraq and Afghanistan Veterans of America (IAVA), the leading post-9/11 veteran empowerment organization and the only major veteran service organization headquartered in New York City, applauds the breaking news that Mayor de Blasio has finally dropped his senseless opposition to City Council bill 314, which would permanently establish a Department of Veteran Services in New York. 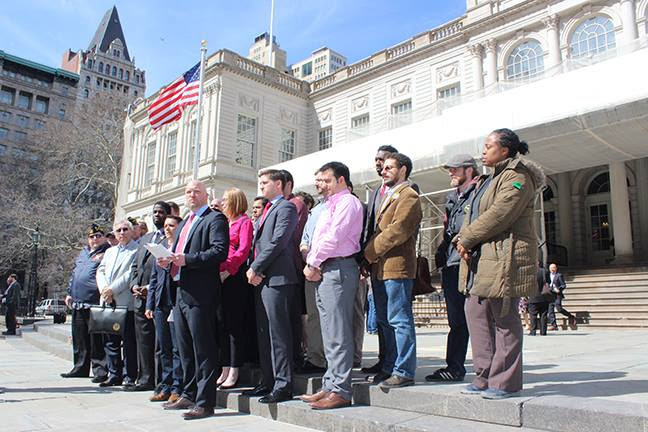 As one if its highest local policy priorities, IAVA has called for the bill to be voted on immediately and is encouraged by Mayor de Blasio’s last minute reversal of his long-standing opposition to create this vital office. “This is a tremendous victory for the veterans movement,” said Paul Rieckhoff, IAVA Founder and CEO. “The Mayor’s opposition was the final barrier to establishing New York as the true national leader for veterans. The passage of this bill next week will be truly a historic Veterans Day gift for veteran activists across New York City—and nationwide. IAVA members have fought for two years for this moment and are thrilled to learn we’re now on the verge of a historic win. The establishment of a dedicated city department for veterans services will be a groundbreaking victory for our community that will save and change countless lives for decades and generations to come. The Mayor’s sudden change of heart is a welcome sign that he is finally listening to New York City’s 230,000 veterans and their families and testament to the power of IAVA and the new veterans movement,” continued Rieckhoff. “For the last two years, the mayor has repeatedly turned down any opportunity to engage effectively with IAVA and the veterans community. And just two weeks before Veterans Day, he couldn’t make the time to meet for a Town Hall involving every major veterans organization in our city. We hope this disengagement and opposition is a thing of the past and that today signals a new day for the Mayor and the veterans of New York City. We look forward to turning over a new leaf and to working with the Mayor to help make our great city the greatest in America for veterans. In October 2014, IAVA first provided Mayor de Blasio and New York City Commissioner of Veterans’ Affairs Loree Sutton with a set of policy recommendations as a means to develop a comprehensive policy plan for New York City veterans. These recommendations included the creation of a new city department for veterans, which would provide substantial resources and options for veterans seeking help on a range of issues, including housing, healthcare and employment. The creation of the department has broad bipartisan support on the City Council. Today’s announcement comes just one week before Veterans Day and one week after IAVA released its updated Policy Agenda – an 11-point comprehensive blueprint for how all levels of government, the private sector, nonprofits and communities can support our nation’s veterans. The agenda calls for improvements to the way federal, state and local governments can improve outreach and support of its veteran residents.